At Bauer GMC, we offer innovative solutions and complete technical knowledge. We offer industry standard gearmotors that are efficient and reliable, certain to work to your advantage in any application. 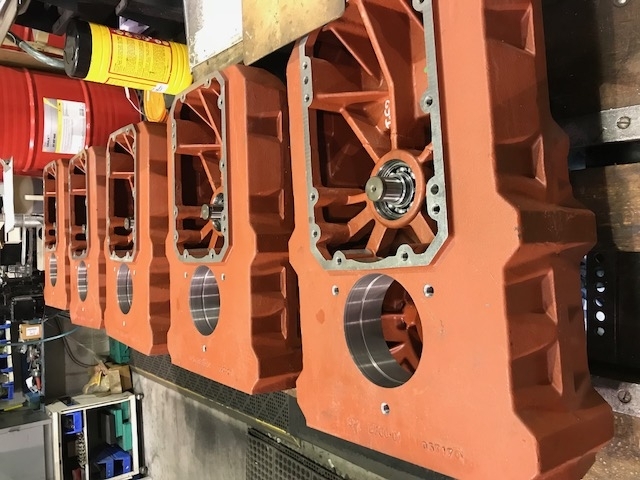 With in-depth technical knowledge and modern facilities, we can offer top of the line gear, customized assembly, maintenance, upgrades and repairs. Our experienced technicians at Bauer GMC can customize the assembly of our gearmotors for any specific application. This project required our full "Corro 3" outdoor application treatment with low temperature oil and bearings, with three coats of epoxy paint and a custom heavy duty encoder with brake. Torque Output. The main purpose of gear motors is to be the main component for power transmission. This is translated as the RPM or speed counted as revolutions per minute as well as the torque produced, or amount of force it can generate. The function of gear motors is to reduce speed and increase the torque. In customizing gear motors, the eventual torque output should be considered and the design works backward from there. Gear Motors Sizing. One of the challenges in designing gear motors is with the size of the gear motors. If the motor is too small or undersized for the load capacity, you can expect a failure to occur after some time. This failure can be the motor burning out or worse. On the other hand, oversizing or using a motor that is too large for the work would lead to inefficiency in the work as well as energy used. Gear Motors Used. Understanding gearmotor capacity and their load requirements is central in determining the ultimate torque to be produced. With full knowledge of the gear motors in use, basic trouble shooting as well as maintenance can easily be done at any given time. Customizing gearmotors is not an easy thing to do. There are many factors to consider to ensure mechanical equipment is efficient, safe and able to meet all the requirements of the job. Three things need to be considered when designing gear motors. Determining the torque output, the size of the gears to be used and the actual motor to be used are some of the ways in which your enterprise can benefit from expert advice. Come to the people who know.